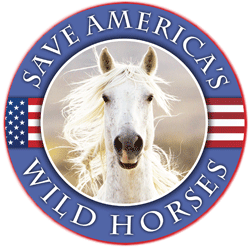 The Bureau of Land Management (BLM) has announced a gather of up to 200 wild horses in the Cold Creek area of southern Nevada – about 30 miles west of Las Vegas. They say horses are suffering from extreme drought conditions and lack of forage. Local wild horse observers agree that some wild horses – perhaps up to 70 (but not 200 that the BLM intends to remove) have stopped migrating up to summer forage higher in the mountains until mares, particularly old ones, with foals are either in poor condition or starving. Las Vegas wild horse advocates proposed to disperse water sources across the range so horses would not concentrate near Cold Creek. Dispersed water sources would also benefit deer and elk, the other large mammals near Las Vegas that the Nevada Dept. of Wildlife (NDOW) has tried to reduce in number by increased hunting licenses. But the BLM and US Forestry Service has extended the environmental assessment until January 2016 and, you watch, they may extend it to May 2016. Three years to analyze simple alternative plans? Why don’t the federal agencies allow reversible PZP on wild horses in our public land in the Spring Mountains? Why indeed? Hay and water both could have been dispersed . BLM will use any excuse to remove our wild horses of course. More “managing for extinction”. Has there been some sort of back-room deal made? Is there some reason that the Public Lands are being cleared? 1. The horse family Equidae has developed many mutually beneficial relationships with the native North American plants and animals with which its members have coexisted for many millions of years. 2. Indeed, the horse can stake the claim as one of the very most ancient and longstanding members of the North American life community, more so than either the bighorn sheep or the bison, species whose origin was in Eurasia before they occupied North America after crossing the Bering Strait land bridge (when oceans receded with the tie up of global moisture during the Ice Ages). Also members of the deer family, Cervidae, have their roots in the Old World and are relative newcomers to North America. 3. Both horses and burros possess a caecal, or post-gastric, digestive system that does not as thoroughly decompose the vegetation they ingest when compared with ruminant grazers, such as cattle or sheep, deer or elk, which comprise the vast majority of large grazers in North America today. In contrast to the ruminant digestive system, the post-gastric system allows the seeds of many plant species to pass through the digestive tract intact and ready to germinate in a soil that equids richly fertilize by their droppings. In this way, many plant species have been and continue to be successfully dispersed over large areas by wild equids. Since wild horses and burros roam over large home ranges, which themselves shift over the generations, each plant species thus dispersed is able to occupy its ecological niche over a more extensive geographical area than it would were it not for the wild equids. 4. Since North America is the evolutionary cradle of the horse family, which includes the burros, many such mutually beneficial (mutualistic) symbiotic relationships have evolved between the horse family in general, on the one hand, and the food plants that sustain them, on the other. 5. It logically follows that if many native plant species are so benefited by horses and burros in North America, then all the animals that depend in some degree upon these plant species are likewise benefited, from fellow herbivores that consume the plants to predatory animals that consume the plant eaters, and on up the food chain. Equids can thus be viewed as complementary to many of the ruminant species. 6. As concerns mutualistic relations, we again note that horse feces contain less thoroughly decomposed vegetable matter than would a ruminant’s and, for this reason, more greatly aid in building the nutrient-rich humus component of healthy soils. This leads to better water retention and nutrient levels for root absorption, and the overall well-being of the horse- or burro-inhabited ecosystem. Also the less-digested feces majorly feed the ecological food chain, benefiting a host of organisms and species from tiny microorganisms to beetles and bugs, worms, birds, rodents, lizards, and larger animals that feed upon these. Additionally, both wild horses and burros are major prey species that contribute substantially to natural predator species such as puma, wolf, and bear. They should be regarded as one with the great tapestry of these large-predator-containing ecosystems and incorporated in regions of wolf, bear (especially grizzly) and puma reintroduction. It would be wise for people to attend some of these agency meetings. You will hear a great deal about “funding”….that’s the name of the game. And they are already out there…..